LMG teamed with The Production Network at the Venetian Hotel and Casino in Las Vegas, NV for CES 2008.Nine Panasonic PT-DW10000U projectors were used for the main keynote event, where some of America's leading CEOs including Bill Gates addressed a huge crowd to talk about the latest trends in consumer electronics.The International Consumer Electronics Show (CES) in Las Vegas, one of the most exciting and largest trade shows on the planet, requires the best audio-visual expertise and equipment to achieve a high quality experience for vendors and attendees. The show brings together tens of thousands of visitors and consumer electronics, technology, gaming and accessories companies to show off the latest and greatest gadgets and tech products of the future. For the last several years, LMG, a national provider of video, audio and lighting technology, has worked with The Production Network (TPN), a production management and design firm, to support the keynote presentations for the event. The keynote addresses at CES provide an opportunity for manufacturers and content creators to showcase their products in a large format, event based presentation. Clients present their latest product offerings and future plans to the public and media outlets. "As the baseline hardware provider for this show, it is critical for us to provide a flexible and functional platform for multiple vendors to showcase their products," said Neil Morrison, LMG's video services manager. This was the second year CES was held at the Venetian Hotel, and for a show of this size and complexity, there can be challenges. First, the show involved integrating video formats from multiple clients and sources into a common high definition platform. "CES is a unique show because it is multi-client related. We're dealing with several presentations and it can get complicated in regards to equipment," said Bob Worden, director of show technology for The Production Network. Worden has been the engineering architect for the CES show for the last 18 years. "It is made less complicated when you have an extremely fantastic repertoire of equipment like LMG has to use in a show like this." Another issue was routing. "This year we moved to all DVI source routing. This was a dramatic sea change in content delivery. One of the biggest challenges moving from conventional graphic routing to DVI routing was managing EDID signaling from the source computers. Because we had to DA and distribute all of the source computers so extensively, EDID signaling can often get lost or confused. We did use a new EDID management product at the source side prior to signal distribution to mitigate this issue," said Morrison. Lastly, staging the show was also a challenge. The set-up took place on January 1-2, rehearsals were conducted on Jan 3-6 and the presentations were held from Jan 6-9. According to Morrison, the crews worked 16-hour days with limited breaks. A Snell & Wilcox Kahuna was used to create the two edge blends for the three screen overlap on the main 15 x50 foot widescreen. For the control systems, DNF Controls' 2044CL were used to control six playback sources. This system worked well due to its ability to merge prerecorded material with live production. Morrison noted the importance of selecting the right equipment to get the job done. "Clients are aware of the new trends in technology for rental and staging events and we want to meet their needs by selecting the latest equipment and technology that is reliable and efficient. When it comes to selecting equipment, projection is always very important to the client, so it is extremely important to us." To keep up with new technology in the rental and staging industry, Morrison said that the primary video considerations are now 1080i and 720p. "HD is becoming more the standard than the premium," said Morrison. "Many more clients are requiring direct HDSDI and DVI connectivity for their events. With our base package for events like these, we have a large HD switching system that combines both 720p and 1080i. We're mixing a lot of sources at the event." At the same time, clients demand improvement in picture quality and higher resolution imagery, which is why, Morrison notes, "we're moving toward DVI for signal path distribution for the high resolution graphics. The HD days are here. Most of the AV vendors have made the transition at this point," noted Worden. He also noted that more clients are now shifting to more widescreen, panoramic screens for presentations instead of using multiple screens throughout the stage. There were many other important pieces of equipment that were used to make the even a success, including a Vista System's Spyder which was used to create the two edge blends for the three screen overlap on the main 15 x50 foot widescreen. For the projector and other video components to run effectively and efficiently, Snell & Wilcox Kahuna switchers were used. "They are by far the most flexible and staging friendly broadcast switchers due to their multi-format capacity," said Morrison. It has the ability to handle both 1080i and 720p which is very beneficial for clients with multiple needs. With CES being an extraordinarily large show, the system had an enormous amount of routing, which can always be a true challenge for any rental and staging team. A 32 x 32 foot DVI router was used for all high-resolution video. During the rehearsals, the crew would go over the routing with the clients. "We were able to deal with any issue prior to a particular clients address, however we had several clients show up with more sources than they had originally planned or that were working in different resolutions," noted Morrison. For the control systems, DNF Controls' 2044CL were used to control six playback sources. This system worked well for CES due to its ability to merge prerecorded material with live production, synchronously play multiple channels, set IN and OUT points to trim clips, and loop one or more channels. For an event such as CES, where multiple devices are in use, including broadcast decks and digital hard drives, this technology was critical. As HD becomes more of the standard and clients demand more innovative technology, LMG and TPN will continue to depend on equipment that is reliable and innovative to enhance the presentation experience from start to finish. 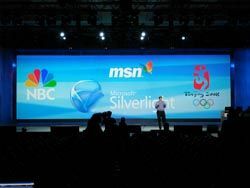 The CES 2008 keynote presentation and ceremonies represent an excellent example of partners joining together to execute a successful event unlike any other in the industry, an event that uses the latest technology available to showcase the latest technology. "CES is the premier event for showcasing new technology, and we enjoy the opportunity to support that effort with the most innovative technology we have to offer," says Les Goldberg, CEO/president of LMG.